Chosen by English teachers and tutors in over 50 countries! Creates authentic conversational practice where meaning matters most. We’ve been told that there are too many lessons in Compelling Conversations. We like to think this gives you choice and flexibility in the classroom. To learn more, try a free sample chapter from this site. 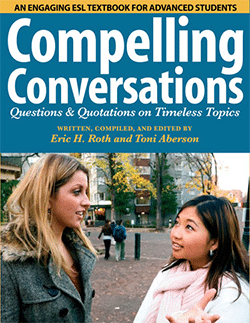 Or, go to the Compelling Conversations page on Amazon.com which has the “Look Inside” feature available. 25. What Do You Think?